Did you know that prior to the 1850s the rural mailbox did not exist? Without the development of the mailbox, we would likely be living in a vastly different world today. As early as the 12th century A.D., humans were using pigeons to send long-distance messages to one another, occasionally saving lives with these messages. The advent of the modern letter delivery service allowed for even better communication, as it depended more on people than pigeons. However, with the humble beginnings of the postal service, mailboxes were soon to follow. But, these boxes for mail did not always look the way that they do today. In fact, there was a wide variety of them that predated the existing one. Read on to find out about the rocky start of American mailboxes. It all began as a simple experiment, with the first Rural Free Delivery Service in 1896. But, it was such a success that it became an official service in 1902. Free mail delivery of any type did not truly exist before the 1850s, making it out of reach for many people. Therefore, there was no need for mailboxes. The beginning of the service truly makes a transition for long-distance communication, but mailboxes were far from standardized at this point in time. People began to get very creative in finding containers to receive and store mail. Historians remark that they used old containers from coal oil, syrup, and food, which were placed outside for the carriers. However, often times the boxes were not even cleaned prior to using them as a mailbox, leaving a sticky residue for the postal person to deal with. The lack of standardization resulted in a wide variety of “mailboxes”, which was not the easiest way for the mailman to know what was and wasn’t a mailbox. By 1901, five years into the experiment and one year before it become a standard service, carriers were constantly complaining about the unsuitable containers used. The solution was a commission of five men to examine potential commercial rural mailbox designs, in order to create a more standard rural mailbox. There were 63 mailboxes submitted for the commission to consider. However, only 14 met the specifications that had been set. The original companies included the Postal Improvement Company, the Bates-Hawley, American Metal Company, Century Post Company, and others from a variety of areas in the U.S. Commissioners hoped that in choosing many different companies that consumers would have plenty of different price points to pick from. 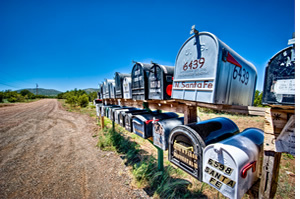 But, the mailbox developers that weren’t chosen complained of a monopoly, which resulted in the postal commission agreeing that any company could make a rural mailbox as long as it met their speciations. By 1903, 46 companies were manufacturing mailboxes, and in 1923 Americans were legally required to have a mailbox outside of their homes to receive mail. Mailboxes that meet the standards originally set by this commission can still be marked today “Approved by the Postmaster General”. Rural mailboxes may have a fairly sticky history, but today they are mostly standardized. But, you can still find ways to receive your mail in style. Moreover, they are a necessity for any American household. In fact, the United States Postal Service delivers about 40 percent of packages to households. For a high-quality rural mailbox, check out our roadside mailbox product page for this historical home and business staple.